View of a glacier from the top in Chugach State Park, Alaska, United States. 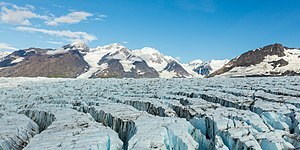 English : View of a glacier from the top in Chugach State Park, Alaska, United States. Two juvenile nolan warthogs (Phacochoerus africanus africanus) having a drink in Senegal. Senegal gained independence from France on 4 April 1960. English : Two juvenile nolan warthogs (Phacochoerus africanus africanus) having a drink in Senegal. Senegal gained independence from France on 4 April 1960. Skylight in the Cybele Palace or Palace of Communication, located on the Plaza de Cibeles, Madrid, Spain. The building, one of the landmarks of Spain's capital, was inaugurated in 1919 as headquarters of the Spanish postal and telecommunications service (Correos). The building was designed by Antonio Palacios and Joaquín Otamendi. Today the building is seat of the City Council. English : Skylight in the Cybele Palace or Palace of Communication, located on the Plaza de Cibeles, Madrid, Spain. The building, one of the landmarks of Spain's capital, was inaugurated in 1919 as headquarters of the Spanish postal and telecommunications service (Correos). The building was designed by Antonio Palacios and Joaquín Otamendi. Today the building is seat of the City Council. Berlin cathedral is reflecting in the river Spree on a cloudy day. View from west towards east. English : Berlin cathedral is reflecting in the river Spree on a cloudy day. View from west towards east. Resurrection of Christ at the winged altar of the parish- and pilgrimage church Maria Laach am Jauerling, Lower Austria. Anonymous master, 1480. English : Resurrection of Christ at the winged altar of the parish- and pilgrimage church Maria Laach am Jauerling, Lower Austria. Anonymous master, 1480. Rows of seats in Olympiastadion Munich which is situated at the heart of the Olympiapark München. The stadium was built as the main venue for the 1972 Summer Olympics. With an original capacity of 80,000, the stadium also hosted many major football matches including the 1974 FIFA World Cup Final and the UEFA Euro 1988 Final. It hosted the European Cup Finals in 1979, 1993 and 1997. Its current capacity is 69,250. English : Rows of seats in Olympiastadion Munich which is situated at the heart of the Olympiapark München. The stadium was built as the main venue for the 1972 Summer Olympics. With an original capacity of 80,000, the stadium also hosted many major football matches including the 1974 FIFA World Cup Final and the UEFA Euro 1988 Final. It hosted the European Cup Finals in 1979, 1993 and 1997. Its current capacity is 69,250. View of a lake in the Eagle River Valley, Municipality of Anchorage, Alaska, United States. 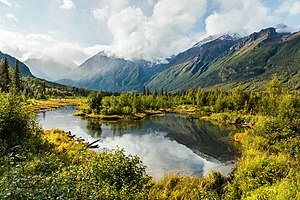 English : View of a lake in the Eagle River Valley, Municipality of Anchorage, Alaska, United States. Mausoelum dedicated to the drivers "Ecuador" del Carchi in the cemetery of Tulcán, located in the city of Tulcán, capital of the Carchi Province, north of Ecuador. The cemetery, of a surface of 8 hectares (20 acres), was founded in 1932 to replace the former on that was damaged in the 1923 earthquake. José María Azael Franco Guerrero was back in 1936 in charge of the city parks and started topiary works in the Tulcán cemetery. In the meanwhile the cemetery park has become internationally popular in the art of topiary and was renamed in 2007 to cemetery Azael Franco to honour his work. English : Mausoelum dedicated to the drivers "Ecuador" del Carchi in the cemetery of Tulcán, located in the city of Tulcán, capital of the Carchi Province, north of Ecuador. The cemetery, of a surface of 8 hectares (20 acres), was founded in 1932 to replace the former on that was damaged in the 1923 earthquake. José María Azael Franco Guerrero was back in 1936 in charge of the city parks and started topiary works in the Tulcán cemetery. In the meanwhile the cemetery park has become internationally popular in the art of topiary and was renamed in 2007 to cemetery Azael Franco to honour his work. North side of Melk Abbey and entry of Melk river into the Danube. View from Emmersdorf, Lower Austria. English : North side of Melk Abbey and entry of Melk river into the Danube. View from Emmersdorf, Lower Austria. Alfred von Croÿ commissioned the english landscape architect Edward Milner with the gardening in the 1860s. The work was carried out by the gardener Charles Barnard. Female southern masked weaver bird with tongue out and toes crossed. English : Female southern masked weaver bird with tongue out and toes crossed. View of the exterior of the Pula Arena during sunset, an amphitheatre located in Pula, Croatia. This Roman edifice was constructed between 27 BC and 68 AD and is among the largest surviving Roman arenas in the world. At the same time, is the best preserved ancient monument in Croatia and the only remaining amphitheater having all four side towers with all three Roman architectural orders entirely preserved. English : View of the exterior of the Pula Arena during sunset, an amphitheatre located in Pula, Croatia. This Roman edifice was constructed between 27 BC and 68 AD and is among the largest surviving Roman arenas in the world. At the same time, is the best preserved ancient monument in Croatia and the only remaining amphitheater having all four side towers with all three Roman architectural orders entirely preserved. Female topi (Damaliscus lunatus jimela) in the Queen Elizabeth National Park, Uganda. H.M. Queen Elizabeth II, accompanied by Prince Philip, Duke of Edinburgh, ended her visit to Uganda on 30 April 1954. English : Female topi (Damaliscus lunatus jimela) in the Queen Elizabeth National Park, Uganda. H.M. Queen Elizabeth II, accompanied by Prince Philip, Duke of Edinburgh, ended her visit to Uganda on 30 April 1954.